Get up close and personal with all things helicopter! 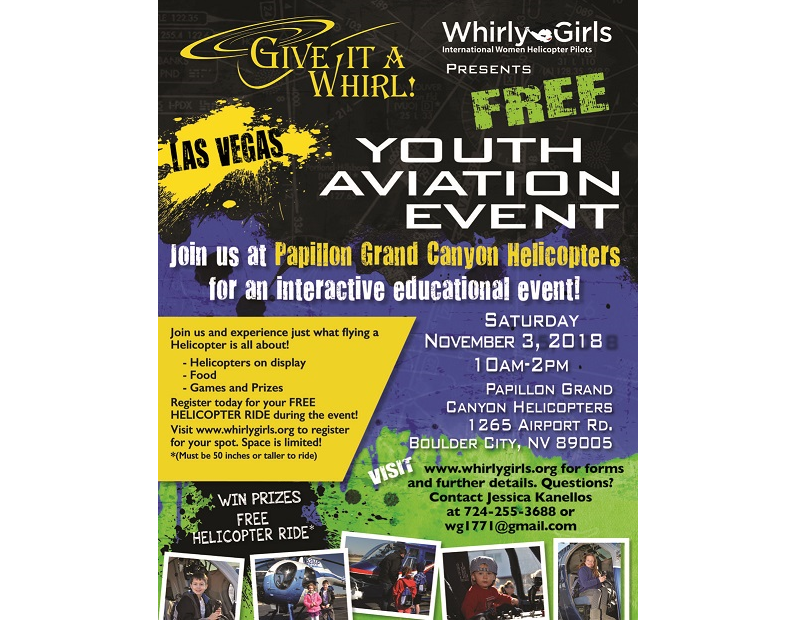 Join Whirly-Girls International, alongside some of the helicopter industry’s best, for a FREE fun-filled event the entire family can enjoy. Mark your calendars for Saturday, November 3, 2018 from 10:00am – 2:00pm and come out to Papillon Grand Canyon Helicopters for an unforgettable experience! The location in Boulder City is about 26 miles from the Las Vegas Convention Center, about a 1/2 hour drive. Explore helicopters up close, make things fly with numerous hands-on aerodynamic activities, and find out just what being a helicopter pilot is all about! Walk away with a FREE bag of goodies and a new appreciation for the helicopter community that you typically only see from a few hundred feet below. This year, with the support of Papillon Grand Canyon Helicopters and Airbus Helicopters, we are offering 100 FREE helicopter rides for the ultimate experience! Download and complete the registration form HERE and remit to Jessica Kanellos at wg1771@gmail.com. Hurry, these won’t last long! Are you a member of the helicopter industry wishing to support this event? Sponsorship and participation opportunities are available in all sizes. Contact Jessica Kanellos at wg1771@gmail.com of 724-255-3688 to learn more.